A salt scrub is the most popular body treatment at the spa. Its purpose is to exfoliate your skin, removing the outermost layer of dead skin cells and leaving your skin softer and smoother. It might also be called a salt glow or a sea salt scrub. These are all basically the same treatment, although the texture and scent of the scrub can be different. At a spa, the salt scrub is usually followed by a shower. You jump up off the table and take a shower yourself, or lay there for a Vichy shower. (Occasionally a spa therapist takes the salt off with hot towels). Afterward, you dry off and lay back down on a dry table for an "application" of body cream or lotion. An "application" means that it is not a message, and the person doing the treatment is not necessarily a massage therapist. A salt scrub is a treatment for your skin, so an esthetician can perform it. You can also buy ready-made salt scrubs or make your own salt scrub at home. As the client, you are either lying on a massage table covered with a towel or sheet or a thin piece of plastic, or you are lying on a wet table that has a shower attached to it. You are offered a pair of disposable underwear, and men are usually required to wear them. You are draped with a towel, and only the part the therapist is working on is exposed. As you lay on your stomach, the therapist rubs the salt scrub gently over your skin. The abrasiveness of the salt removes the dead skin cells. Then you turn over and the therapist exfoliates the other side. If they rub too hard, be sure to let them know. When the therapist is finished, you may be asked to step into a shower to rinse off all the salt. Don’t use soap or shower gel because you want to keep the oil and aromatics on your skin. If the spa is doing the treatment on a special wet table, the therapist will either rinse you off with a hand-held shower or turn on a Vichy shower, a special six-headed shower that is parallel to the table. After you dry off, the therapist applies a lotion. 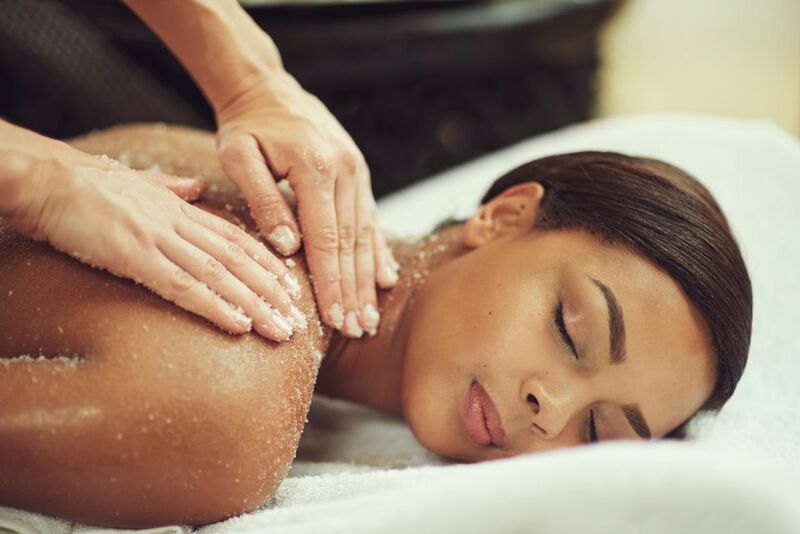 Don't expect a full massage unless it's part of a longer signature treatment, often called a "ritual" or "journey" (usually involving a scrub, wrap, and massage). You can get a salt scrub on its own, but often it’s the first step in a body wrap, often a seaweed or mud wrap. That’s because exfoliation prepares the skin for products like seaweed or algae that detoxify the body by stimulating circulation through vasodilation of blood capillaries. You can also combine a salt scrub with a massage. Get the salt scrub first because it is stimulating, whereas the massage calms you down. Salt is fairly abrasive, and some therapists have a heavier hand than others. Individuals also differ in their skin sensitivity. If the salt scrub feels too harsh, speak up.